Hallwood Farm is nestled on a South facing slope overlooking unspoilt countryside on the edge of the thatched village of Petrockstowe with its own friendly pub. This part of Devon is truly beautiful; gentle rolling hills, tree lined fields and ancient woodlands abound. The farm is approached along our park like ‘made up’ driveway bordered by water meadows with ancient oaks and a babbling stream. The Farmhouse, a traditional Devon Longhouse, is set amidst 90 acres of pasture and woodland where our guests are free to roam and explore at leisure. The accommodation, for 2-10 people, is in a well appointed self contained wing of the large farmhouse which offers stunning views across green fields and woodland towards the distant moors. This idyllic location is at the hub of some of The West Country’s favourite tourist attractions and the best walking and cycling routes including The Tarka Trail which passes through our village. Richard & Ruth are farmers producing seasonal vegetables and fruit for their busy vegetable box business along with rare breed pork, beef and lamb on their beautiful farm. They along with their grown up children are actively involved in the busy little village of Petrockstowe. They have been offering quality assured self catering holiday accommodation for 14 years now. They are friendly people and like nothing better than to spend a little time explaining about their farming to any guests who are interested. We had been farming vegetables on a large scale for the supermarkets in Kent when we decided 'enough was enough'! We relocated to this beautiful area of Devon set up our holiday cottage and started growing veg and keeping livestock but this time we sell direct to our customers. Hard work but a lot more rewarding! Although we are set amidst the most beautiful countryside we are not isolated, we enjoy our village and it's friendly pub and we are only a short car ride away from stunning coastal and moorland parts. The farmhouse is ideally and centrally positioned in the heart of the Devon countryside. Coasts, Forests, Moors, quaint market towns are all within easy reach. Top west country attractions are nearby too such as RHS Rosemoor, The Big Sheep, The Milky Way, Clovelly, NT Castle Drogo, Eden Project, Okehampton Castle and Torrington 1646 are all easy striking range. Excellent surfing is available on the North Devon coast, just a 25 minute drive away. We are very close to the 'Tarka Trail' so brilliant choices of walking, cycling from the door. Hallwood is a mixed farm so there is always plenty to see, and all are always welcome out on the farm to see what is going on. En-suite to Bedroom 1 with power shower, Downstairs bathroom with power shower and bath, Upstairs bathroom with bath and shower over bath. Notes on accommodation: A working farm where guests are welcome to wander. Children often 'needed' to help with feeding. Shortbreaks always welcome out of main school holiday times. Short walk to village pub. Outside: Lovely large south facing enclosed garden with large decking area, barbecue and stunning views Utility Room: Washing machine, large drying room Cleaning / Towels / Linen / Maid service: Bed linen, hand towels and tea towels provided. Bath towels available to hire. We have just had 4 great days here with elderly parents- was a huge success. We so enjoyed feeding the pigs, and also the company of the perfectly behaved dogs who’d greet us whenever we came home. Great facilities. Enjoyed a bbq outside our first night and tucked into some delicious home made sausages from the farm shop. 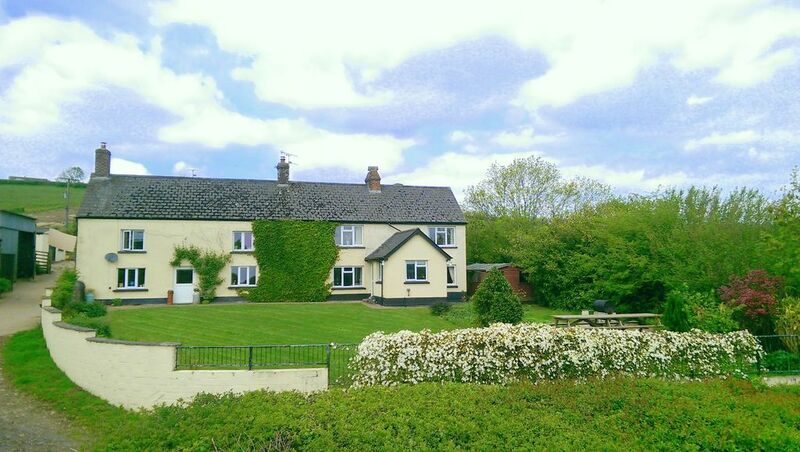 Hallwood Farmhouse certainly seems to be ideal for multi generational groups. So glad you all had a lovely time and that the house catered so well for your needs. You certainly brought the weather! We loved it from the start. Our three grandchildren were in heaven, each morning their first thought was to feed the ‘ Piggies’ ! The actual farmhouse was so comfortable and cosy in the evening’s if it turned chilly. On our last night we had a barbeque in the late sunshine . Thank you Ruth and Richard for your friendly hospitality, sausages and salad !!! We will try to visit again one day . Best wishes to you both with love from the Hall family from Devon. Thank you for your kind comments. So glad that you all enjoyed your stay at Hallwood. We are lucky to have such lovely families here to visit. We had a lovely weekend in this farmhouse. The weather was perfect and we were able to sit on the patio in the large garden overlooking the stunning views. The cottage was well equipped and perfect for our needs and we will probably return for a longer stay. The cottage suited us as we wanted something very rural and we sampled two of the local pubs and were well fed. It was also let a very reasonably price. Highly recommended. Thank you for your kind comments and so glad you you enjoyed your stay! We really are blessed to be amidst such stunning scenery. Would love to have you back at Hallwood one day.